Richard Authier was born in Huron, South Dakota on December 18,1948. His parents were Moe& Lauretta Authier. Milton (Milt) would attend school in Woonsocket, South Dakota. He would be coached by the famous Ralph Weddle in his early years. In the 1964-65 season the Redmen had a record of 21-3, Milt was named honorable mention to the All-State team and this would only be the beginning for the 6-4” Sophomore . Woonsocket fans realized they had a diamond in the ruff. The 1965-1966 season was a very difficult year. The Redmen would lose to the Parkston and Gerhard Buenning in the regional finals. The Redmen would finish 19-6 that season. In 1967 Milt was chosen as a First Team All-Stater in both Basketball and Football. At 6-7 and nearly 190# he was catching the eyes of college teams. 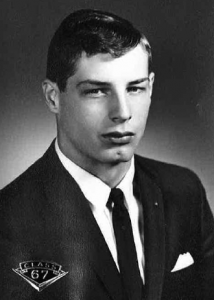 Milt would select the University of South Dakota in 1967 and played Basketball for the Coyotes. In fact in 1972 he was chosen as the North Central Conference MVP and named to the small college All American Team. Milt presently lives in St Paul,Minnesota. Milton is the first player to be selected from Woonsocket High School in to the South Dakota High School Basketball Hall of Fame. We are proud to induct you into the 2014 Hall of Fame Class. Congratulations! You have made the Redmen proud. Perhaps this will motivate some of the current young rising stars to strive a bit harder…to reach for that next level of performance. I was out of high school before you were a freshman, yet did follow your success – and that of the Redmen – for the next 4 years.